National Review: Palin's 'Mama Grizzlies' Bite Back It's no news by now that Sarah Palin's name carries political weight. But as Robert Costa explains, the Palin -backed "emerging, conservative, feminist identity" in the GOP has been taking some serious strides in California and South Carolina elections. Former Alaska Governor Sarah Palin waves to supporters after she endorses South Carolina gubernatorial candidate Nikki Haley. Oh, those "mama grizzlies, they rise up." So says Sarah Palin, rightfully, and it bears repeating after two high-flying lady Republicans she championed swept to victory on Tuesday. In South Carolina, Nikki Haley outdistanced three rivals in the GOP gubernatorial primary (falling just short of a majority, but she is heavily favored to win the runoff on June 22), while in California, Carly Fiorina held off four Republicans in a crowded Senate primary. Their wins are Palin's, too. Haley and Fiorina are examples of what Palin last month called an "emerging, conservative, feminist identity" in the GOP. In other words, the rise of Palinistas: smart, pro-life conservative women who succeed with style -- and a dash of controversy. The latter they address with a smile, and, Thatcher-like, with a quick quip or a swift kick. Haley, for her part, denied the allegations of adultery, though some feared the tawdry whispers would damage her fresh-faced reputation. They didn't. In fact, with a little help from Palin, who seems to relish lowering a Facebook boom on foes, Haley weathered them with ease. On the social-networking website, the former Alaska governor laid into Haley's haters and offered a glimpse into a Palinista's world. 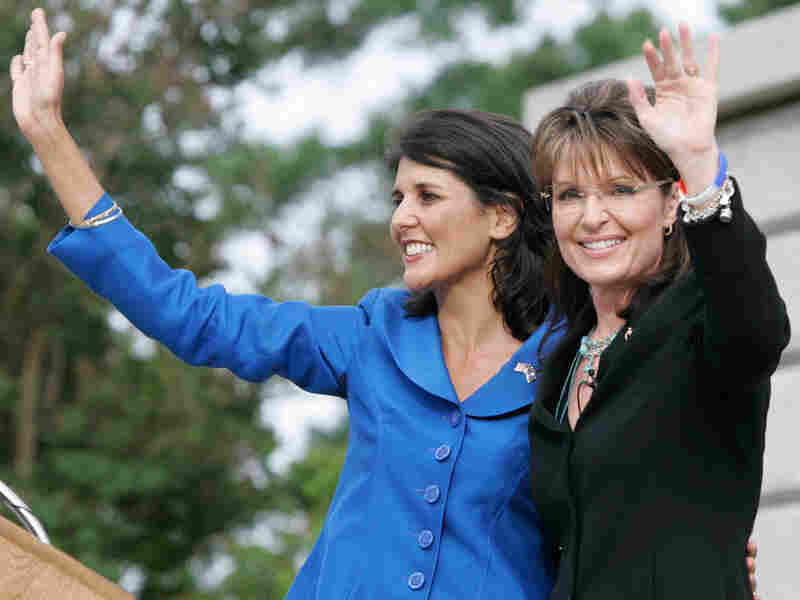 "I warned her and her family that she would be targeted," Palin wrote, that "she would be put through some hell. . . . As I said to Nikki this morning, 'Hang in there. I've been there.'" Haley did, and she has kept her comfortable, double-digit lead in the polls. Deftly playing victim, and punching back at sexed-up slime, may be politics as usual in South Carolina, but for national observers, it's also Palin 101. As Walter Shapiro of Politics Daily put it, Haley mastered "boomerang politics -- making every attack seem like a vindication of her conservative populist outrage." That has been a favorite Palin technique since the days when nobody outside Alaska had heard of her. Tangling with opponents, however, is not the only element of Palinista politics. Friendly debate with tea-party groups is another. Palin -- an outsider to the GOP establishment before she was tapped as the veep nominee, and its pit bull once brought inside -- remains a trusted tea-party favorite. Though she is close to the movement, it's important to note that she's not of the tea parties. She was around, and battling Obama, before tricorner hats began to pop up en masse. That warm affinity and simultaneous lack of debt to the tea-party movement has enabled Palin to be independent, and surprisingly unpredictable, in whom she chooses to endorse. While Haley, a tea-party darling before she got Palin's nod, was an easy, no-trouble pick, Palin's endorsement in California's GOP Senate primary caused a bit more tension on the right. In early May, Palin posted a note to her Facebook followers about Fiorina, the former chief executive of Hewlett-Packard. "I'd like to tell you about a commonsense conservative," she said, one who, like her, "grew up in a modest home with a schoolteacher dad, worked her way through several colleges, and then entered an arena where few women had tread." While a "huge proponent of contested primaries," Palin explained that she was backing Fiorina because her "fiscal conservatism is rooted in real-life experience." The uproar came fast. Thousands of conservatives commented in anger below the Facebook endorsement, scratching their heads about why Palin, of all people, would back Fiorina, whom they considered a RINO (Republican in Name Only). Chuck DeVore, considered by many, including Sen. Jim DeMint (R., S.C.), to be the most tea-party-aligned of the contenders, was left empty-handed. With Palin having endorsed her former running mate, Sen. John McCain, a moderate, in Arizona's Senate primary months before, "that's two strikes against you, little sister!" wrote one commenter. "One more and you're done." Shelby Baker, a leader of Tea Party Patriots, complained to Human Events that the "bloom's off the rose," dubbing Palin "a company girl . . . a Republican, and not in a good way." Palin eyed the online debate for a bit, and then jumped in with a Facebook update. Look, she typed, "some reaction right out of the chute calls for more information." Fiorina, she argued, is "pro-life, pro-traditional marriage, pro-military, and pro-strict border security and against amnesty," as well as being for repealing Obamacare and for supporting the Second Amendment. "That's no RINO," Palin mused, "that's a winner." Some still didn't buy it, finding Fiorina to be, as the Telegraph explained, "insufficiently robust against abortion." Nevertheless, Palin's willingness to mix it up with tea partiers will only help her should she decide to run for the GOP presidential nomination in 2012. For Palin, policy ideas and values are important. So, smartly, is winning -- especially when it comes to electing her hand-picked crop of Palinistas. "No matter your gender or politics, you have to hand it to her: Palin is fearless," says Mark McKinnon, a former adviser to Pres. George W. Bush. Despite the complications, that's good news for the GOP's electoral chances. "Sarah Palin -- feminist first, tea partyer second," said one recent Christian Science Monitor headline. About that, we shouldn't be too sure. For Palin, it seems, it's about electing Republicans, just with a mama grizzly, please. From what we saw last night, her strategy is working.